Howard Chandler Christy's famous portrait of the signers of the Constitution is used to interactively introduce the delegates. Hover over a delegate to see his name and click the image to learn more about him. Words change meaning over time, so this glossary from The People's Guide To the Constitution is helpful to understand the meanings of the terms as they were used in our founding documents. Website set up to celebrate the ratification of the Constitution and provide education to anyone interested. 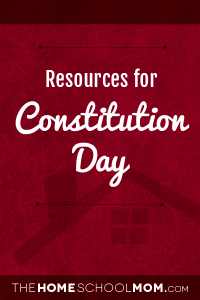 Provides information and resources to educators and citizens to celebrate Constitution Day. From Shmoop.com Excellent resource on the students level. From Funtrivia.com. This quiz is on the structure and content of the U.S. Constitution. Biographical information of all the delegates. Completely fascinating! From TeachingAmericanHistory.org. Great information to help students understand what took place at the Constitutional Convention. From Scholastic Teachers. Scholastic News Online talks to Caroline Kennedy about the Constitution. ConstitutionFacts.com provides free educational resources and Internet links to help educators with student programming to celebrate U.S. Constitution Day on September 17th of each year. The Constitution, the Bill of Rights and the Declaration of Independence - and much more. You'll find interesting insights into the men who wrote the Constitution, how it was created, and how the Supreme Court has interpreted the United States Constitution in the two centuries since its creation. In observance of Constitution Day, K12 presents K12 History lessons to help students learn about this important American document. Online activities and printable worksheets. Free Online Resources from the Constitutional Rights Foundation. Compares some of the provisions of the Articles of Confederation with those in the Constitution. From George W Bush-White House Archives White House Kids. Independence Hall is the assembly hall where the Declaration of Independence was signed. The Liberty Bell is located there as well. The website offers links and information for folks not able to visit in person. This Primary Source Set includes images, documents, maps, sound files and analysis tools to help teach about the United States Constitution. Early America.com allows students to see the "Freedom Documents" -- the Declaration of Independence, the Constitution and the Bill of Rights as they first appeared to the public at that time. Includes the full text of each document. To encourage students to comprehend checks and balances, separation of powers, Bill of Rights and amendments and relate them to the study of the three branches of our federal government. Several activities are described. The culminating activity is the "Power Grab Game" given before the final test on the Constitution Unit.